light causing the two men to drop their jaws and run to the side of the ship. In Manitowoc, our little friend has gone back to sleep, he never saw the flash of light, heard the crash or witnessed the eerie, green glow of his lakeshore community’s sky. An hour later, two Manitowoc police officers, patrolling in their squad car, notice what looks to be a piece of cardboard in the middle of the street. Choosing to ignore it, they go about their rounds, coming back an hour later. This time the boys venture out of the vehicle to get a closer look. As they near the glowing object, they realize this is far from cardboard. Nestled 3 inches deep into the asphalt of 8th Street is a 20 pound chunk of debris that’s hotter than Texas chili in July. Initially they discard it as a piece of slag from a local foundry and they kick it to the curb. By noon, the officers associate what they’ve seen with the reported breakup of Sputnik IV. They rush back to the spot and find the piece still in the gutter. It was sent for analysis and was determined to be a piece from Sputnik IV and thus marked the birth of Manitowoc’s link to space age history. Today, visitors on foot or in a car, place themselves in danger each year as they stand to have their picture taken next to a metal ring in the middle of one of the city’s busiest streets. A plaque on the sidewalk touts how the satellite fragment was recovered at the site on September 5th, 1962. 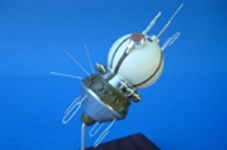 A hop, skip and a jump to the west will take the curious into a lovely museum where a replica of the Sputnik IV chunk has made a place for itself. TV stations have interviewed the locals, England has called for information on it and the mayor’s been interviewed by NPR because the Smithsonian doesn’t even have something this cool. Photographed by many and the focus for Sputnikfest, this piece of space junk will bring sci-fi lovers, Miss Space Debris hopefuls, a trekkie or two and visitors from near and far. UFO’s may pepper the sky and Sputnik lovers will crowd the streets just to be part of the space age all over again.